All of our products ship directly from our different warehouses across the United States so you get your items quickly and in perfect condition. We know how important it is for you to get what you ordered and get it fast. Our products are a 100% authentic and brand new. We work with the biggest suppliers of high quality products to bring you only the best items. ArmorAll’s Utility Wet/Dry Vacs have the ability to clean up both solids and liquids, offering seemingly unlimited uses. The 2.5 gallon polypropylene tank is small enough to carry around, but large enough for most jobs. 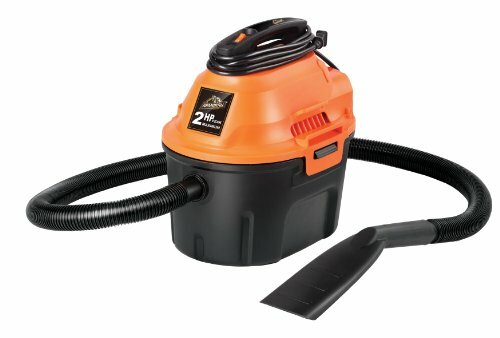 A 2 horsepower motor provides ample suction power, as well as an easy conversion to a blower function. Auto shut-off detects fill limit and prevents overflow. Top handle and onboard accessory storage make for easy carrying. Built-in air and noise diffuser minimizes volume. Other great features include a 10-foot cord with wrap, 6-foot, 1.25-inch hose, reusable cloth filter, reusable foam sleeve, 2-in-1 utility nozzle, crevice tool, deluxe car nozzle, blower nozzle, and detail brush. No assembly required.